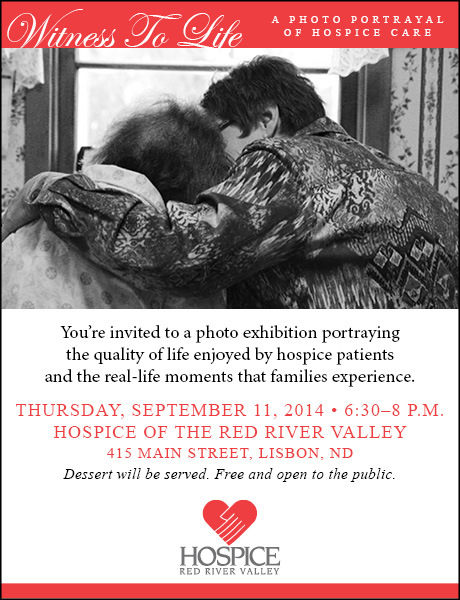 On Thursday, Sept. 11, 2014, Hospice of the Red River Valley’s Lisbon office is hosting a community event from 6:30-8 p.m. featuring a photo portrayal of the quality of life enjoyed by hospice patients. The series of photos, featuring three Hospice of the Red River Valley patients, portray real-life family moments, the memories they create together and the relationships that develop along the way. During the event, Jodi Rae Ingstad, volunteer coordinator for Hospice of the Red River Valley, will explain how volunteers help enhance this compassionate, end-of-life care. Additionally, she will share Hospice of the Red River Valley’s current volunteer needs in the Lisbon area. Dessert will be served. This event is free and open to the public. Please feel free to bring a guest along. For more information, please contact Jodi Rae Ingstad at (701) 490-2605 or jodi.ingstad@hrrv.org. This project took shape in 2009 when Minnesota State University Moorhead invited Hospice of the Red River Valley to participate in a two-year project resulting in both an online magazine for the university and a photo journal for Hospice. The shared goal was to illustrate—in words and pictures—the quality of life possible through hospice care. We are most grateful to the families whose journeys are witness to the power of living well until the end, and to the three students who captured the most sacred of times. Theirs is a gift of timeless and priceless value. This Witness to Life exhibit originally opened at the Plains Art Museum in October 2011, and was open to the public through February 2012.